There’s nothing worse than finding that tea or coffee stain on the surface of your home furnishings, and that is where custom coasters come in as a great promotional idea to prevent this from happening. 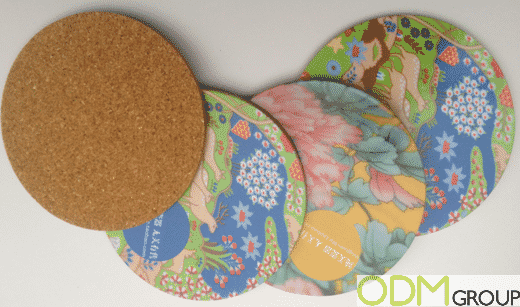 These custom coasters are made from cork, which have excellent heat protection qualities and hide the brown stains from the tea or coffee much better than when made on your wooden surfaces. Cork is also a eco-friendly material and is very durable, meaning these items have a long product lifeline. These custom coasters come in a circular design, and the top can be printed with your own company design making the branding potential for these coasters great. They would make excellent promotional gifts as free gifts in on pack promotions, sold in sets as a gift (which in this case is a set of 4) with purchase item or as free giveaway’s during events and promoting a new product range. Why do custom coasters make good promotional merchandise? Increase brand awareness. Coasters make very practical gifts and can be used at home, in shop store displays, or even in the office, boosting plenty of opportunities to show off your cool designs, and brand logo. Expanding product range. If you are a drinks companies especially in the coffee and tea industry, these coasters could make the perfect product for promotions in introducing a new product range. Custom coasters can be designed to match your new product range designs. 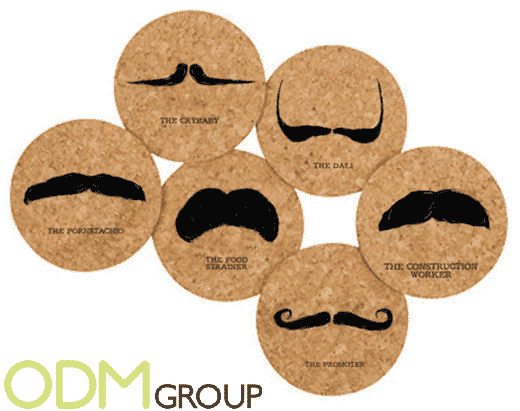 At ODM we understand the importance of creating interesting promotional products such as these custom coasters. If interested in designing your own, feel free to contact us and quote product number ODM-1060. Below are some more cool ideas for coasters and other related items.